Okay, I am back at my easel working diligently(?) on my commission piece. I've got another one in the wings but it will not be documented nearly as much as this one has been. For those of you who wondered what I was talking about when I said last time that "Coming soon: mermaids! ", well, I still don't have a mermaid ready to display yet but I AM working on them. I have a request for a mermaid painting for my niece/flower girl/cutest thing in the world (right next to her little sister), that will be given to her for her birthday. Her birthday is in November which is a heck of a lot closer than it was 6 months ago when the idea was first put forth to me. So I am pulling out all of the preliminary sketches I've been playing with for six months and seeing which compositions work best, what kind of style I want to zzzzz.... What?!? You don't care about all of that technical artsy crap? Don't blame ya'. It's fun to do (for me anyway) but talking about it is for teachers and know-it-all art students. But I may get a few of the better ones and see if anyone has an opinion on the overall look of the mermaids. Back to the now. 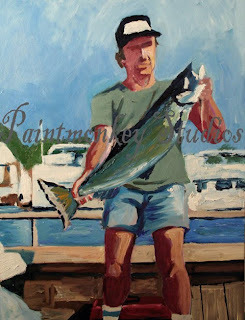 Here is the latest work done on my fisherman. Hope you like it. Paintmonkey Studios Is Now Taking Commissions!